Physical description: Illustrated in Ukiyo-e dai musha-e ten - 浮世絵大武者絵展 - (The Samurai World in Ukiyo-e), edited by Yuriko Iwakiri, Machida City Museum of Graphic Arts, 2003, #75, p. 189. 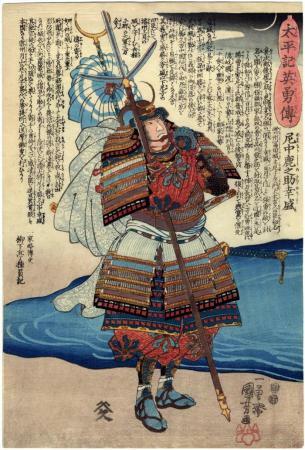 Yamanaka Shikanosuke was a senior retainer of the Amako daimyō. He was born on the 15th day of the 8th month of 1545. Shika means 'deer'. There was a famous one-on-one battle between Shikanosuke and Shinagawa Daisen, who changed his name to Taraki Okaminosuke, which was meant as an insult to his opponent. Okami means 'wolf' and wolves kill deer. The battle took place on an island in the Toda River. There were many onlookers. It was an epic conflict but Shikanosuke won and cut off Okaminosuke's head and held it up shouting "The deer has killed the wolf!" It should also be noted that at Waseda University they give this title as 太平記英勇伝 which is only different in the last kanji character.